← Refugees and the Image of Suffering: Why Does Nobody Listen? Zdravko Saveski and Vladimir Kunovski, longtime activists and members of Levica, the recently-formed left-wing party in the Republic of Macedonia, have been kept in house arrest for over a month now. Recently, their detentions have been extended for additional 30 days. They are being detained because of their participation in the anti-regime protests which began after the unconstitutional decision by the President to pardon 56 individuals suspected of heavy crimes. These events have exposed the absurdity of judicial system in Macedonia, where complete immunity from prosecution is guaranteed for the corrupt elites, whilst excessive penalties are given to those who fight injustice. The house arrest is undoubtedly too harsh, considering the evidence and the fact that neither of the two have ever committed offences in the past. We have reasons to suspect that there have been strong pressures from the President of the Court and the Public Prosecutor. In our view, the measure is purely political, and it aims to weaken Levica and the wider protest movement. Clear indicators of this are also the other similar measures of intimidations, such as requests for protesters to attend so-called informative talks in the police and detentions of protesters, which have intensified in the last few days. 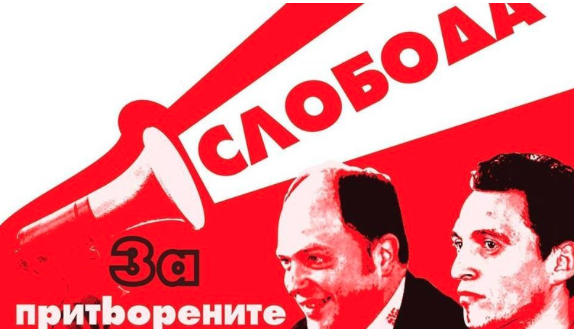 We demand the revoking of the house arrest and the immediate release of Zdravko and Vladimir! We demand a cessation of the pressures on protesters! We demand an urgent end to the use of detentions as a measure of punishment! One Response to Free Zdravko and Vladimir! Stop prosecuting protesters in Macedonia!